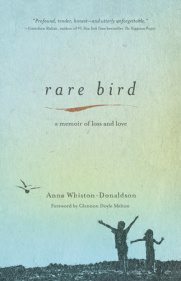 I was very eager to read my friend Anna Whiston-Donaldson’s memoir, Rare Bird: A Memoir of Loss and Love, but I had my share of apprehension as well. It is, after all, a memoir of grief and loss, of a mother and a family losing a son, a brother, a nephew, a friend, in a horrible drowning accident. It is a story of mourning and keening and faith and love and the unbroken bond between a mother and a son. I knew about Anna and Tim and Jack and Margaret from Anna’s blog, An Inch of Gray, and I knew how important Anna’s faith is to her and her family. Secretly, I planned to skip the parts of the book that I thought would be too religious for my taste. Instead, I read every word of Rare Bird. Part of it is that Anna is a lyrical writer with gorgeous prose, but a bigger component to me is that the discussion about faith is so personal, so non-judgmental and is so part of the fabric of who she is, that it was impossible for me to look away. In getting to know Anna’s family, faith is a cornerstone. It is woven into the fabric and is a natural part of the narrative. Learning about her only son, Jack, is a treat, every story, every memory is precious, not just to the family that loves him but to the reader who can now see him. Anna wants us to know that he was a real boy, not a “two-dimensional paragon” and in writing about his caring, his humor, his “symmetry” and we do. We get to see him through her eyes, and through his father’s and his sister’s, and that transforms us. It is impossible not to relate to Anna, impossible not to really like her. Family is precious to her, “people were more important than money, things, or getting ahead,” memories are powerful. She is every-mom, busy, tired (sometimes grumpy), enjoying alone time reading on summer vacation, watching over her children. So when she takes us through that horrible day when her 12 year old son Jack went to play in the rain one September afternoon and did not come home, there is a resonance that extends beyond the written word. That is the power of parenthood, of a mother’s love. “Should I scream and flail around? Why am I acting so calm? Am I mother or a robot?” Anna asks about the day of the tragedy. If there is a way for a parent to act when an unspeakable happens, no one knows what it is. But the notion that even when your world stops spinning, a person can be calm, normal, almost, is recognizable. When one of Jack’s classmates tells her that sometimes she pretends that Jack is just in the bathroom, Anna understands. Because that makes more sense than his drowning. There is no making sense of a child’s death, of course. “How could God possibly think it was a good idea to take Jack?” Anna’s heart is asking. And so is the reader. She is still Jack’s mom. She is Jack’s mom forever. Her love for her son is not in the past, it endures. And that’s what makes Rare Bird such a poignant love story. 1. Anna writes, “I soon learn that prior closeness does not determine who will show up for you” explaining that some people who she previously had a casual relationship with show up for Anna’s family, whereas a close friend disappears from her life after Jack’s passing. Do you think this is a common phenomenon of closer friends pulling away? 2. Is Anna correct in thinking that it is not easy to be friends with a grieving mother? Have you ever stepped into that role and what was the experience like? 3. How do we make sense of a world that is unfair? Jack, a healthy young boy dying is a tragedy, nowhere near to fairness, and Anna recognizes that it is no more fair when a child is stricken with a terminal illness, or a child growing up in poverty in Afghanistan or Somalia. Life is filled with tragedy. How do we cope? Please join us next month as we discuss The Power of Habit, Charles Duhigg. Oh, you’ve captured the essence of the book right here. Relatable, regardless of religion. She is talking about HER relationship with God, how it is a part of her and her family, and not telling you you need Jesus; find him now. The book is lyrical, absolutely. Your descriptions of it, of Anna’s writing, are spot on. It is so much more than a book on early grief. It is for mothers, for friends, for families, for everyone. This is by far one of the BEST book reviews I’ve read in a LONG time.